As is usually the case, everyone is on their own for breakfast so we each got up and wandered into the kitchen when we felt like it. We spent the morning talking and doing not much of anything else while we waited for John and Greg to arrive. Val brought a jigsaw puzzle along for everyone to work on. We've done this for the past several years and we end up doing a lot of talking while we fit the pieces together. Other than that it was a typical Geezer Gathering; not a lot of excitement, but lots of conversation. We are geezers after all. John and Greg flew into Phoenix and rented a car for the drive to Flagstaff. They arrived right on time around noon and stopped on the way to buy lunch supplies for the week. We helped them unload their luggage and groceries and then we all sat down to lunch. 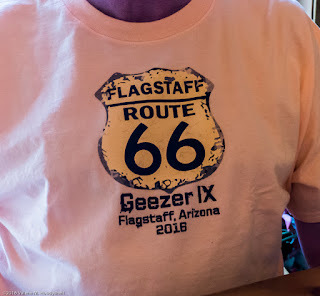 After lunch Val presented everyone with their gift bags that she prepares every year, which includes our Geezer t-shirts. 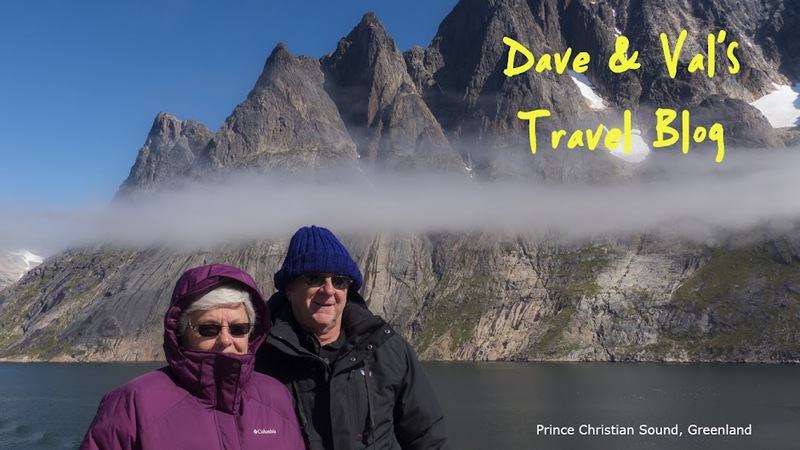 We also usually bring back something from our travels and since we had just finished our Voyage of the Vikings cruise we brought everyone a Viking helmet; the group photo should be very interesting this year. The rest of the afternoon was spent visiting, laughing and working on the puzzle. The whole purpose of our yearly get together is to be able to spend time with one another and catch up on what is going on in our lives. Val does the t-shirt design every year and I think this is one of her best. 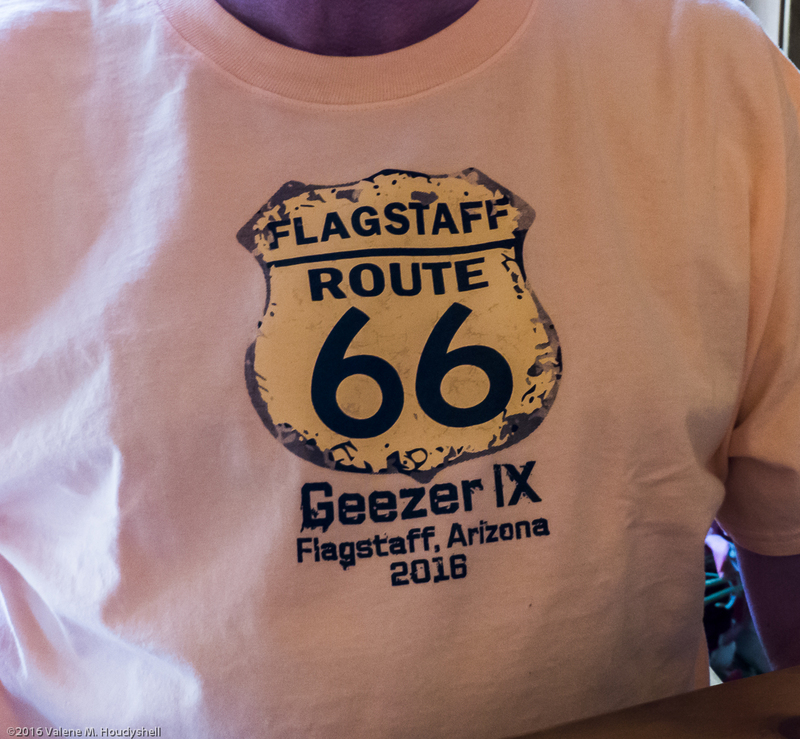 Historic Route 66 went right through Flagstaff and is an important part of the history of the city. Steph was in charge of dinner tonight and made a delicious meal of pork chops, rice and a cucumber salad, but the real star of the meal was the dessert. Steph made the best chocolate cake that I have had in a very long time, it was delicious. She said it was called wacky cake and the recipe came from her family and the depression era – I can see how eating cake that good would make you feel better during a bad time. After dinner we talked a while, but Greg and John had been up since the wee hours of the morning to catch their plane so they called it an early night and the rest of us followed suit soon after they did. Nothing is planned for tomorrow so it will probably be more of the same.